By the early 19th century, The Industrial Revolution had made England the leading manufacturing and trading nation in the world. In 1800, London was already the world’s largest city, and its population would almost double over the next four decades, to approximately two million. Large numbers of the working classes, drawn to jobs in commerce and manufacturing, began to attend the theatre for the first time, causing major changes to entertainments formerly reserved for more well-to-do patrons of the arts. 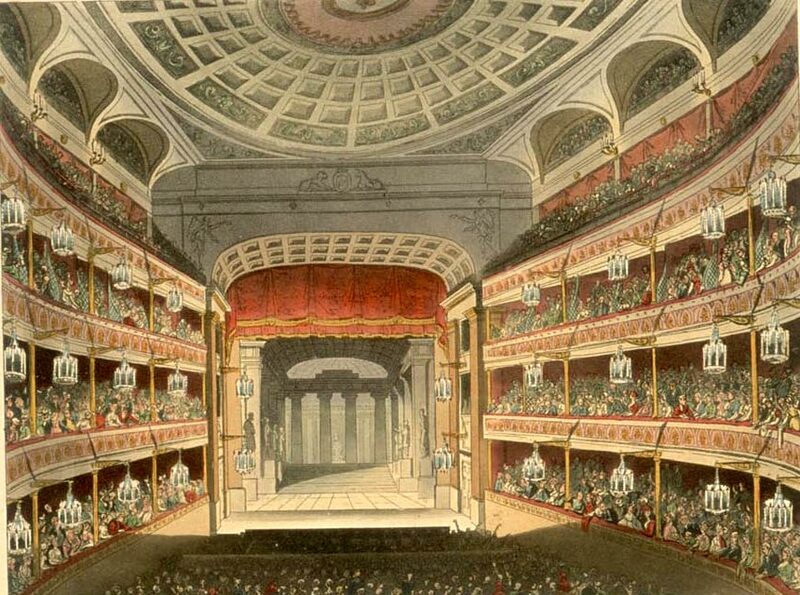 Both Covent Garden and the Theatre Royal, Drury Lane, were rebuilt in the 1790’s to accommodate about 3,000 and 3,600 people, respectively. Minor theatres were opened outside Westminster in the 1780’s and 1790’s; then, in 1804, when the Earl of Dartmouth became Lord Chamberlain, he authorized the licensing of minor theatres inside the City of Westminster, so long as they did not infringe upon the rights of the “patent houses” of Covent Garden, Drury Lane and the Haymarket. He also authorized longer seasons for the Haymarket, which had been restricted to a five-month season and, by 1812, it was open seven months of the year. Attempting to retain audiences, the patent theatres began to include minor dramas in their offerings and extended the evenings to five or even six hours. By 1820, it wasn’t unusual for the evening’s bill to include two full-length plays, an afterpiece, and a number of variety acts. Since only the patent houses could play regular drama, along with the minor genres, the other theatres found loopholes offered by the burletta and the melodrama, characteristically a three-act play with a musical score. Thus, regular drama, such as Shakespeare, could be performed in three acts with musical accompaniment and called “melodrama.” This game of ruse and subterfuge continued throughout the Regency and after, until the Theatre Regulation Act of 1843, which abolished the privileges of the patent theatres, and allowed any licensed theatre to perform works of any type, although all plays continued to be licensed by the Lord Chamberlain. The upper classes might have worn their very best, but otherwise, theatre-going was an informal business, with members of the audience talking loudly and arriving or leaving at any time during the performances. Dandies strolled and mingled in the “pit,” taking snuff and showing off the latest fashions. Most of the romantic poets of the day attempted drama, including Coleridge, Wordsworth, Keats and Shelley. George Gordon, Lord Byron, who was a member of the governing committee of Drury Lane, wrote more plays suited for the stage than the others, although only one was actually performed during his lifetime (and that one, “Marino Faliero,” in 1821, over his objections). The best known actors and actresses on the London stage during the Regency included several members of the Kemble family, especially Sarah Kemble Siddons, who was considered the greatest tragic actress of her day until her retirement in 1812. The Kemble “classical” school of acting was continued by Charles Mayne Young (1777-1856), J. M. Vandenhoff (1790-1861), and Eliza O’Neill (1791-1827). Their classical approach was challenged after 1814 by the romantic school, perhaps best exemplified by Edmund Kean. Kean perfected the style, and exerted his “star power” frequently to demand £50 or more for each performance, an amount unheard of before his time. Other well-known performers, such as William Charles Macready (1793-1873) and Mme. Eliza Vestris (1797-1856), later went from the stage into theatre management.